Nylon Bags for cooking in Restaurants and Kitchens. These Restaurant Supply Nylon Bags are strong and work well. Cook, bake, and roast up to 400 Degree F. These nylon bags are perfect for baking, warming, transporting, and serving. Prevent direct metal-to-food contact to enhance appearance and improve moisture and flavor retention. Nylon bags eliminate the labor intensive job of scrubbing and soaking baked-on foods. Makes clean-up a snap At the end of the day simply twist tie leftovers and store or dispose. Handgards Nylon Bag - 18 in. x 14 in. Nylon Bag - 34 in. x 12 in. Nylon Bag - 18 in. x 24 in. 400 Degree Ovenable Nylon Food Bag - 34 in. x 16 in. Roast Full Size Nylon Bag - 34 in. x 25 in. 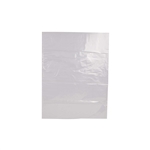 Roast Half Size Nylon Bag - 24 in. x 12 in. Buy your restaurant supply Nylon Bags from the leader in restaurant supply.